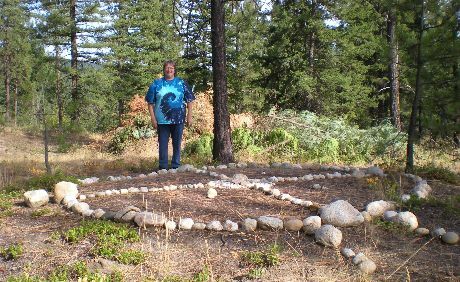 My guides say "We wish to ask you – those who do not feel worthy of a great endeavour like this – we ask YOU to make your own medicine wheels, that you may start to gather tribe – those known and unknown to you into the sacred spaces in celebration of the times of alignment. Alignment of your planet and your great sun-star and the centre of your Milky Way! All Solstices and Equinoxes shall be celebrated!" And so, this is a call to anyone who has land which is big enough to gather a group of 7 or more people together, to make a sacred space in which some of our tribe may celebrate the special dates! These 5 dates per year include the Solstices, the Equinoxes and 'Triple dates'. You are asked to make a Medicine Wheel on your land (simple instructions below) and to be willing to invite both friends and those you may not have met before to these gatherings. (A format for sacred celebrations will also given if you need suggestions.) It is not necessary for you to be at every celebration - if you plan to be away during one of the dates, you may ask someone else you trust to hold the space for that occasion. The term 'Medicine Wheel' is used by Native American tribes to express a complex spiritual teaching system about the 4 directions. In this context, however, my guides are referring only to physical structures outside on the land, like the ones pictured - spaces which are set up with clear intention to be used for sacred celebrations by groups of our tribe of humans. Some wheels have a cross through the middle which separates it into 4 quadrants, but the instructions for these new wheels is different - it is simply to place 4 large stones on the outside circle to mark the 4 directions, with 4 smaller stones or crystals in-between them. The centre of the wheels will be marked by an amethyst point which may or may not be set into a stone. As these dedicated spaces are used over and over again for sacred celebrations, the energy they hold becomes more and more powerful. They become inter-dimensional portals in which all who are gathered are charged and empowered! The gatherings of tribe are about getting more and more like-minded groups of people together who have a united intention to empower themselves & others and to create peace on Earth! My guides have been stressing for years that getting together and celebrating the 'times of alignment' is crucial in the lead-up to 2012. The gatherings are times when we will celebrate with our tribe and connect in joy and gratitude with Gaia and our Sun-Star! Bring it on! 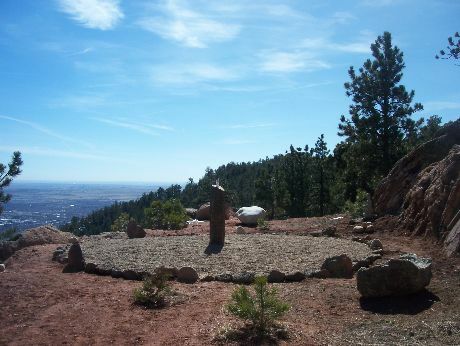 Cynthia Kendall has made a stunning Medicine Wheel on the edge of her mountain land in Boulder (below), Colorado, and had 33 Light tribe celebrating with her at her very first Ceremony! You will also need 4 large stones (1 or more feet high), 4 smaller stones or crystals, and an amethyst crystal point. Using a compass, mark the centre point of the circle and then place a marker for the north, south, east and west directions on what will be the outside circle edge (perimeter) of the wheel. Choose 4 large stones to hold the energy of each direction - first choose the stone for EAST (fire) and place it in that direction on the outside edge of your wheel. Then moving sun-wise (clockwise), the stone for the SOUTH (water), then for the WEST (earth) and finally for the NORTH (air). Choose these with intention, asking for guidance on choosing the right stones, and placing them around the circle with due ceremony. Perhaps you might cleanse each one with burning sage as you place it. Thank each stone, and with its permission, dedicate it to the holding of the place of that particular element in the Medicine Wheel (fire, water, earth or air) If you use a different system of directions-to-elements that is also perfect. Now choose and place 4 further stones or crystals to mark the south-east, the south-west, the north-west and the north-east. You may choose to make the outside circle continuous by adding small stones between the 8 main ones, or you may leave it as it is. Either way, move around the whole circumference now smudging it with a sage stick and dedicating the space for the highest good of all. Connect with the guardian of the land and the ancestors, asking for their assistance in your endeavour. Now place the amethyst crystal point in the centre of the wheel. Use your clear intention to connect this amethyst with the energy of all the other wheels which have been made.The Amethyst may be cemented into a stone or simply placed as it is. 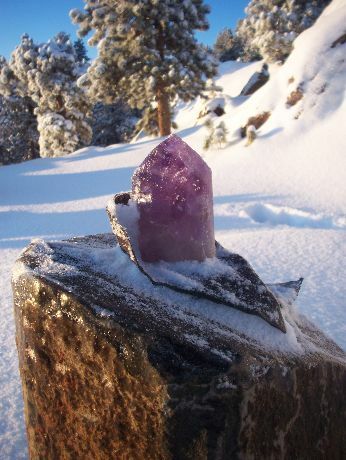 My guides have said "The amethyst points, whether they are polished or natural, will hold the portal open. They hold the violet ray of St Germaine, so that all negativity is transmuted. The central directions, all-that-is-above and all-that-is-below will be activated by these central crystals." This is for those who need assistance/suggestions - if you have some experience in shamanic ritual or leading ceremonies please do your own thing! Working/playing in groups is the way in the New Age. It has been proven many times that when a group of people focuses on the same thing (as in group prayer or healing), the effect is far greater than the sum of the people present: 7 people together visualising peace of Earth is not 7 times more powerful than 1 person doing it - it is 7 x 7 x 7 times more powerful! In every aspect of ritual, intention is all important! Honesty, integrity and sincerity are key - it's not about 'putting on a show'. Your intentions and heart-felt desire to connect with each other and to honour and connect with Gaia determine how effective and moving the ceremony is. Spontaneity is important - go with the flow, don't get hung up on a very strict program, encourage everyone present to participate as much as possible and MAKE IT FUN! These are also CELEBRATIONS, it's important to remember that we join together to move into joy together! Ritual is a CELEBRATION OF LIFE. It is a way of outwardly expressing gratitude to the Earth, the Sun, the Universe and the Creator. Indigenous tribes have always used to ritual to keep their lives meaningful and to show respect for all-that-is - but they also got together for these celebrations because that was their way of having a party! Let us re-birth the ways of the ancestors and in the process make our lives simultaneously more meaningful and more fun! Do the ceremony at sunrise or sunset if possible - but if this isn't practical another time on that day is also fine. Clear the space with sacred sage or other herbs/sprays before the ceremony, and make the area pretty with flowers/candles etc. According to the season it is nice to have flowers and decorations which represent that time of year. Everyone who attends can be invited to bring crystals/sacred objects with them to add to a central altar. A fire is always a wonderful option at a ceremony (especially when it is cold!) Because of the amethyst point it will probably not be practical to have a fire in the middle of the circle, but there can be a separate area with a fire which is used after the calling in of the directions, etc. It is wonderful to sit around a fire after a ceremony and chat/sing/ have a bowl of soup! · There can be one or more leaders for the ceremony, who 'hold the space' for the group and follow the order of the ceremony which they have agreed on beforehand. 2. INTENTIONS: Go around the circle, each person saying their name and their intention for the ceremony. When each person has spoken, he/she says 'AHO!' and everyone says 'AHO' back at them in recognition of their words. (It is traditional to go around the circle Sun-wise (clock-wise) when opening, and to close going around Earth-wise. 3. SMUDGING: One of the leaders (or more than one) will move around the circle 'smudging' each person present with a sage smudge stick (a bundle of dried white sage, as used by indigenous tribes for aeons - easily ordered online at amazon, etc). It helps to have a 'smudge fan' which is usually made of feathers, so that you can waft the smoke into the person's energy field. Smudge each person from head to toe on the front of their body and then the back. You may say an invocation of your choice as you do this, like 'Let go of anything from your energy body which doesn't serve you, right here, right now'. The person being smudged stands with arms slightly away from the body and eyes closed, receiving the gift of the sacred her plant with gratitude and joy. There may be drumming or music while this takes place. 4. CALLING IN THE 4 DIRECTIONS: Choose which direction to call in first, according to the season and celebration, and move sun-wise as you call each one in. EVERYONE FACES THAT DIRECTION AS YOU CALL THE ENERGIES IN. Myself and my daughter Gabby singing (and giggling!) some chants, made for the Summer Solstice coming up, and any other Solstice/Equinox celebrations, for calling in the 4 directions/elements. Make your own or learn these - improvise, add harmonies & choruses - BE CREATIVE! The idea is that the whole group gathered can join in during the ceremony. Sing with love and joy and gratitude for our Mother Earth and Father Sun! Thanks to Robeena Sky for helping me with these chants! Fire fire fire - fire the transformer! Bring us inspiration, burn away the old! A stick or natural object of some kind should be chosen for the talking stick' - a practice of passing a stick from one person to the next going around the circle. Whoever holds the stick speaks, and no-one is allowed to interrupt them, aside from an 'AHO' which means that that person agrees with what they are saying or just wants to encourage them. The theme of that round with the talking stick is stated by the leader. When they are finished talking, they say 'AHO!' and everyone says 'AHO!' back at them in recognition. The stick is passed onto the next person. In this round, each person is encouraged to speak on the theme of the ceremony itself, which might be the change of the seasons or the energies of the triple date, etc. The leaders can agree on the theme of this talking stick round beforehand, which will be different according to the number gathered. If the group is small, each person could be asked to bring a poem or song, etc - whereas if the group is large just a few sentences will do. This is an opportunity for each person present to speak from their hearts and/or share something with the group. It's important that everyone feels they are participating in the celebration and not just 'being led'. There can be as many rounds of the talking stick as you like during the ceremony, and at any stage. 6. SONGS/DANCE/DRUMMING: This is very much up to you - how much part this will take in your ceremony. You might encourage people to bring rattles and other musical instruments along - those who are gifted at singing can lead a son or teach the group a chant. Make it fun! 6. CLOSING: Someone might officially close the ceremony by thanking all guides and helpers who have been present. The final step is to hold hands once again and go around the circle, each one saying what is in their hearts in that moment. Remember, this is just a guide-line! Improvise and follow your hearts! efforts a great spider web of sacred spaces will start to encompass the globe! Love and thanks to all who participate in this exciting adventure!